A review of The Wanton Line: Hogarth and the Public Life of Longitude, by Katy Barrett. This dissertation was written as part of a five-year, AHRC-funded project on the British Board of Longitude, carried out jointly by the National Maritime Museum and the Department of History and Philosophy of Science, University of Cambridge. Alongside the members’ research activities, the project achieved the full digitization of the archives of the Board of Longitude and associated materials, held in the Cambridge University Library. The Wanton Line uses as its focal point the “longitude lunatic” (p. 1) scrawling diagrams on the walls of Bedlam in the final plate of William Hogarth’s A Rake’s Progress (1735), working outwards into a multi-faceted contextual study of what, exactly, was so problematic about the longitude problem in eighteenth-century England. The story of John Harrison’s chronometer is among the heroic narratives of eighteenth-century technological development. But, as The Wanton Line demonstrates, Harrison’s struggles with the Board of Longitude were profoundly shaped by the networks of people, representations, objects and practices that gave “longitude” an intense and coherent range of meanings between 1714, the year of the passage of the Longitude Act, and 1818, when the Board’s remit broadened to include the search for the North-west Passage and projected voyages to the North Pole. While keeping in view the most familiar proposals for finding longitude at sea -– using a mechanical timekeeper, lunar distances, the eclipses of Jupiter’s moons, magnetic variation and dip, and the synchronized rockets envisioned by William Whiston and Humphrey Ditton -– Barrett also reveals the cacophony of voices clamoring for the Commissioners’ attention. The extraordinary level of public preoccupation with the longitude problem, she argues, can only be explained if these other, less credited proposals are given serious consideration. These, in turn, are represented as one among many genres or cultural settings in which eighteenth-century people found the longitude good for thinking with. Barrett organizes her topic thematically, addressing in three successive chapters the “visual” problem with longitude –– its practices of representation, with special attention paid to the medium of engraving; the “mental” problem with longitude –– its proximity to madness, enthusiasm, and the reckless or mercenary innovations of projectors; and the “social” problem with longitude –– the ways in which it refracted contemporary, gendered distinctions between proper and improper behavior, both intellectual and sexual. The approach that links these diverse issues is two-fold. First, Barrett employs “longitude” as a keyword. She deliberately brings into play Raymond Williams’s sense of a keyword as a “significant, binding [word] in certain activities and their interpretation” and a “significant, indicative [word] in certain forms of thought” (Williams, Keywords, London: Fontana Press, 1983, p. 15). In order to establish the range of the term’s significance, she has also used “longitude” as a search term in major online databases. Second, Barrett takes up Ludmilla Jordanova’s call in The Look of the Past (Cambridge: Cambridge University Press, 2012) to reflect the power of visual culture in lived experience through the incorporation of images as evidence. The result is that a fugitive and complex cultural moment becomes the central subject of analysis, rather than acting as explanatory device or background color. Chapter 1, “‘the lines, which are so very fine’: The Visual Problem with Longitude” (pp. 18-80), is concerned with widespread efforts to control the interpretation and use of engraved lines, whether on maps, in illustrations of instrument designs, or in pictures such as those in Hogarth’s A Rake’s Progress. At issue, on the one hand, was the question of how these lines might shape the practices and perceptions of the people who used them; and on the other hand, anxieties about how engravers’ and inventors’ property in such lines might be protected from misinterpretation and unregulated copying. In exploring these themes, Barrett draws on Bruno Latour’s notion of the “immutable mobile” which, as she points out, “requires inscriptions to be moveable, but also mobilizable, useable as resources in discussion” (p. 31). The relationships established between the medium of engraving and other media and forms of action are crucial to this discussion, since the problem of publically defining longitude depended on them in multiple ways. Barrett productively draws out connections between changing regulatory frameworks around copyright and patent in the 1730s, and issues of intellectual property and public benefit as they played out in relation to the longitude problem. Harrison’s interactions with the Board of Longitude were shaped by mistrust around these matters; disputes repeatedly hinged on what constituted adequate disclosure of his chronometer’s design, and what the best means were for making such a disclosure. Barrett’s discussion on engraved figures in longitude pamphlets in Chapter 1 demonstrates that their authors were participating in active conversation with one another, noting recent developments and adapting in response to criticism. Chapter 2, “‘if the Love of Money cannot be said to be the Case, they must be no better than as if out of their Senses’: The Mental Problem with Longitude” (pp. 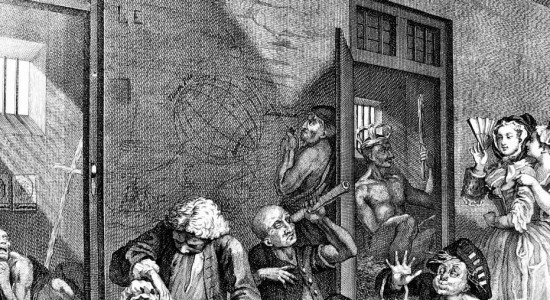 81-148), returns to Hogarth’s Bedlam scene, widening the frame of public conversation around longitude to include its uses in satire and its strong associations with mental disorder or bad faith motivated by financial gain. The negative stereotype of the “projector” shaped perceptions of individuals proposing solutions to the longitude problem, both in the satires of the Scriblerians and in the correspondence of the Commissioners of Longitude. As Barrett writes, projecting in the eighteenth century “represented the imposition on the public of new, naïve, ridiculous, impossible, or even malicious schemes; the perversion of established institutions and knowledge by untested inventions” (p. 84). Through the figure of William Whiston, the longitude problem was also directly associated with dangerous innovation and “latitude” in religion. The question of how credit was assigned to new knowledge-claims in the seventeenth and eighteenth century has been addressed influentially by authors including Simon Schaffer, Steven Shapin and Mary Poovey. Barrett builds on this historiography to show how Harrison’s use of language that departed from accepted conventions cast him in the mold of a projector, either deranged or mercenary, and thus damaged his credit in the eyes of the Commissioners. The strong links that eighteenth-century people saw between longitude and mental, religious, or social disorder –– and the sometimes scatological terms in which these connections were made –– placed it in problematic relation with the demands of politeness. Chapter 3, “‘Experimental Exhibitions’: The Social Problem with Longitude” (pp. 149-209), deals with the impoliteness of longitude, especially in relation to gender, sexuality, and the ways in which instruments intersected with these. Returning again to Hogarth’s Bedlam scene, Barrett turns her attention to the two refined and voyeuristic women whose gaze rests, in one version of the image, on the half-clothed body of the “longitude lunatic” absorbed in his calculations. The literature on “polite science” in the eighteenth century is large and well established. Here, citing Peter Stallybrass and Allon White’s The Politics and Poetics of Transgression (London: Meuthen, 1986), Barrett turns attention to the licentious behavior and language on which the definition, through contradistinction, of politeness depended. Advice on polite conduct, plays, jokes and bawdy poems all asserted the dangers that undue interest in mathematics and astronomy posed for women’s sexual behavior. It provided ample opportunity for flirtation with male tutors, through “philosophical” conversation freighted with innuendo. Husbands’ over-preoccupation with the longitude problem might lead their wives to seek sexual satisfaction elsewhere; a woman’s assertive interest in the same topic was often read as a sign of immoderate appetites. Barrett places the proposals of Jane Squire, the only woman named as an author of a longitude pamphlet, within the context of these anxieties, as well as that of widespread skepticism about women’s ability to comprehend advanced mathematics. Within this wider picture of moral stricture and disorder, instruments could function both as incitements to transgression and emblems of restraint. While the longitude problem played a vibrant role in the expression of moral and sexual tensions in the eighteenth century, Katy Barrett argues that by the first decade of the nineteenth century, its “iconographic ‘moment’ … had passed” (p. 211). Her conclusion touches on the twentieth-century afterlife of Hogarth’s Bedlam image in the work of David Hockney, who deployed it both in his own series of etchings (A Rake’s Progress, 1961-2), and in the stage set he designed for John Cox’s production of the opera of the same name at Glyndebourne (1975). It thereby suggests the lasting efficacy of Hogarth’s images, and of tropes arising from the eighteenth-century preoccupation with longitude, for representing “narratives of mental and social boundaries” (p. 217). This dissertation is a rich, contextual study, drawing on little-known sources, and it contributes materially to the current understanding of longitude as a public concern in eighteenth-century London. But its greatest impact lies in the approach that it takes, unpacking a single image in order to describe a multi-faceted cultural moment. There is a strong argument for, and much current interest in, the interdisciplinary potential of visual and material sources in the history of science. But the central problems of making connections between levels of analysis, genres of historical writing, and diverse kinds of evidence are largely unresolved. The Wanton Line provides a model for addressing these key methodological challenges in a comprehensive and coherent way. University of Cambridge and Royal Museums Greenwich. 2014. 271pp. Primary Advisors: Simon Schaffer and Richard Dunn. Image: Detail of ‘The Rake’s Progress’ Plate 8 by William Hogarth (1735), showing the ‘longitude lunatic’, (C) National Maritime Museum.